Our new friend, my Bay Area Blogger of the Week, Beth Spotswood is funny and smart and gorgeous and perhaps a little brave given that she invited us, her previously virtual-only friends, to her Birthday bash at the Washington Square Bar & Grill last night. Despite having once lived for 18 months only two blocks away from this old-school San Francisco eatery, I'd never been before. But I was noticeably impressed. Our bartender, who served us aperitifs was all smiles, friendly and witty to boot. 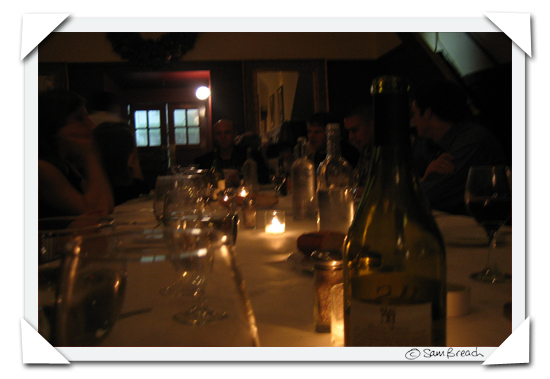 And when the 25 of us sat down to dinner, everything ran more smoothly than I would ever expect from an establishment providing dinner for such a large and boisterous group. We were even allowed to order a la carte despite being warned to expect a set menu. The food is not revolutionary but it doesn't need to be. This is the menu where you'll probably find something you will simply just enjoy eating. I ordered a tuna tartare and linguine with clams which were nothing extraordinary, but Fred's succulent Asian Spiced Baby Back Ribs with Tamarind-Ginger Barbeque Sauce and Peanut Cabbage Slaw were something I might have to return for. His carbonara was irresistible too, I think I ate more off his plate than I did off of my own. The Washington Square Bar and Grill did a stellar job of catering for a group and I wouldn't hesitate to recommend it as a destination for large celebratory occasions. And as for Ms Spotswood, although she writes about Top Chef from time to time, I can't really pretend she is a food blogger, but if you live in the Bay Area please don't pass up on her witty commentary and her love for Gavin Newsom over at her hilarious blog I'll Flip You. Flip You For Real. 2006 | Noodles? For Sunday Brunch?! Sam, I believe I heard that the FABULOUS bartender from the remodeled Hotel Majestic has relocated to Washington Square Bar & Grill. If he is a red-headed, slender man with a face that looks decidedly unmodern (there is a compliment), a consummate professional, then his name would be Tim. Tim had quite a throng who were angry at the Majestic for letting him go. He is a prince. It's the Majestic's loss. Boy, he must miss the room, though—the history and the ghosts and the spirit. Sam and Fred, I'm THRILLED to be blogger of the week and so honored that you guys came to the soiree. I had so much fun! tana - the bartender who served us was female so not yer man. beth - no thank YOU for inviting us! Tim (from majestic) is now at the presidio social club.